The Census Bureau’s preliminary estimate for starts in buildings with five or more apartments in March came in at a massive (seasonally adjusted annual) rate of 392,000 units. In the Census construction report, this shows up as a 27 percent increase over February. However, the number for February was itself revised upward by 24,000—so the five-plus starts rate for March is actually 38 percent higher than the production rate we thought prevailed a month ago. At 392,000, the five-plus starts rate is the highest it’s been since January of 2006 (a one-month anomaly that at the time was explainable as the industry’s response to changing building codes in some states). Even if we smooth some of the volatility out of the five-plus starts series, the 3-month moving average is up to 325,000. That’s above the annual number of five-plus starts in any year since the 1980s, so even the current moving average seems a bit too high to sustain going forward—a contention supported by the permit numbers in the latest construction report. The report shows that, in March, the (seasonally adjusted annual) rate at which new five-plus permits were issued dropped 8 percent to 283,000, while the number of five-plus permits waiting in the pipeline (previously issued but not yet converted to starts at the end of the month) declined 19 percent, to 38,400 (not seasonally adjusted). 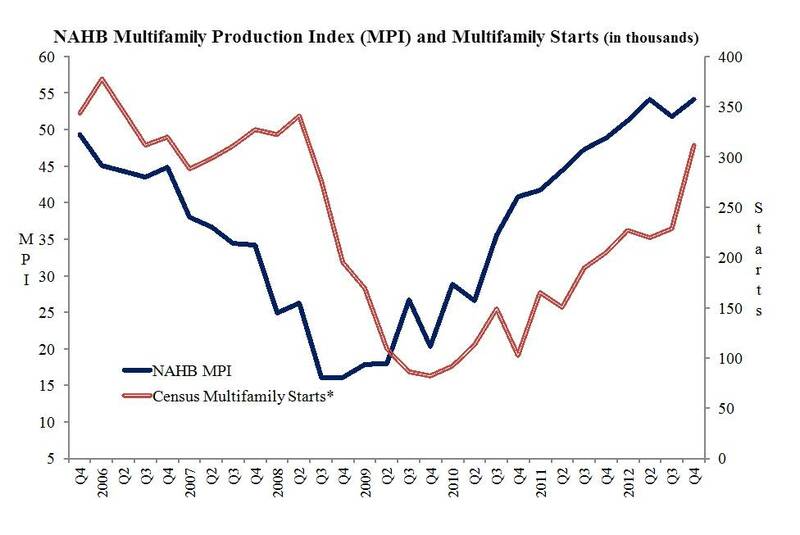 In the fourth quarter of 2012, NAHB’s Multifamily Production Index (MPI) increased two points to 54, marking the fourth straight quarter the index has been over the key break-even point of 50. The MPI is an overall measure of builder and developer sentiment on current conditions in the apartment and condominium market. The MPI is built from three components, capturing industry sentiment on production of low-rent, market-rate rental, and “for-sale” units (or condominiums). Each component lies on a scale of 0 to 100, where a number over 50 means more builders say conditions are improving than say they are getting worse. The MPI typically functions as a leading indicator, turning one to three quarters ahead of the official series on multifamily starts. After the latest downturn, for example, the zigzagging upward trend in the MPI began about three quarters before a similar pattern emerged in the starts series. Although the MPI’s market-rate rental component dropped four points in the fourth quarter, it still remains well above the break-even point at 65. Moreover, the market-rate rental component has now been above 60 for six consecutive quarters—the longest sustained period above 60 since NAHB launched its multifamily survey in 2003. Meanwhile, the MPI’s condo component reached its highest point since the fourth quarter of 2005, increasing two points to 46, while the low-rent component increased seven points to 53. The MPI is one of two major sentiment indices produced from NAHB’s quarterly multifamily survey. The other is the Multifamily Vacancy Index (MVI), which recently has shown ongoing strength in demand for existing apartments and is one of the reasons NAHB expects multifamily production to remain fairly strong. However, builders and developers are starting to encounter constraints to their ability to keep up with increased demand—particularly emerging shortages and rising costs of building materials, labor and land. A complete history of the MPI and each of its components is available on NAHB’s web page for the multifamily market survey. The Census Bureau’s preliminary estimate of starts in buildings with five or more apartments for January came in at 260,000 (at a seasonally adjusted annual rate). As predicted in last month’s post, a rate well in excess of 300,000 proved too high to sustain. In fact, the five-plus starts rate for December was revised upward, from 330,000 to 352,000—so the preliminary estimate for January shows up as a 26 percent decline, dropping the five-plus starts rate back to where it was in November. 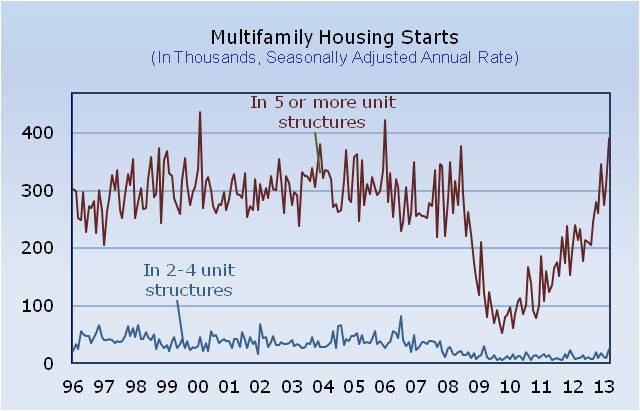 Month to month fluctuations on this order of magnitude are not unusual in the multifamily construction series, however. On a year-over-year basis, five-plus starts were still up 35 percent, reflecting the generally upward trend in multifamily production that has prevailed since the end of 2010. Meanwhile, the rate at which new five-plus permits were issued remained relatively stable in January, increasing 1 percent to 311,000—the third straight month the five-plus permit rate has been slightly above 300,000. The rate of new five-plus permits usually runs a little above the rate of new five-plus starts (partly because of the Census Bureau’s tendency to reclassify some units considered multifamily by local permitting offices as single-family attached). Nevertheless, the five-plus permit numbers in recent construction reports have been strong enough to suggest that a five-plus starts rate at slightly above 260,000 is sustainable over the short run. In December, the (seasonally adjusted) annual rate of starts in buildings with five or more apartments increased by 23 percent from the revised figure for November, to 330,000. The November figure was revised down substantially, but the big news is that the rate of multifamily production continues to climb, even after the large improvements it made in September and October of 2012—to the point where, at 330,000, the five-plus starts rate is now up 115 percent year-over-year. Historically, this also marks the first time the monthly five-plus rate has been over 300,000 since June of 2008, shortly before the housing downturn hit the multifamily industry. Meanwhile, the rate at which new five-plus permits were issued in November declined by 1 percent to 301,000, while the backlog of unused permits in the pipeline increased by roughly 6 percent, to 46,800 (not seasonally adjusted). Overall, the December permit numbers were strong enough to indicate that the five-plus starts rate is likely to remain relatively healthy in the short run, although a rate as high as 330,000 may be a little too much to sustain. In November, the (seasonally adjusted) annual rate of starts in buildings with five or more apartments was 285,000, according to the latest release from the Census Bureau’s Manufacturing and Construction Division. In the release this shows up as a 4,000 increase from October, but the five-plus starts rate for October was revised downward by 4,000; so the preliminary rate for November is exactly the same as the rate initially reported for October a month ago. Irrespective of any revision, the five-plus starts rate has been relatively stable and over 280,000 for two consecutive months now—the highest this measure of apartment production has been since July of 2008. Although not as high as annual production during what many consider the “golden age” for multifamily housing (roughly 1997 through 2006), a five-plus starts rate of 285,000 is high enough to rank as one of the weaker golden-age months. Meanwhile, the rate at which new five-plus permits were issued in November increased by 10 percent—largely offsetting the previous month’s decline and taking the five-plus permit rate back up over 300,000. The backlog of unused, previously issued five-plus permits in the pipeline was also relatively stable in November, at 44,000 (not seasonally adjusted). On balance, the November permit numbers indicate that, subject to the normal monthly fluctuations, a five-plus starts rate in the neighborhood of 280,000 is likely to be sustainable over the short run. The Multifamily Production Index (MPI), released by the National Association of Home Builders (NAHB), remained fairly steady in the third quarter of 2012 at 52—the third straight quarter the index has been over 50. The MPI measures builder and developer sentiment about conditions for apartment and condominium construction, and is are scaled so that any number over 50 means more builders and developers report conditions are improving than report conditions are getting worse. When conditions are changing, the MPI generally turns before the data on actual construction. The MPI is built from three components, capturing sentiment about the construction of low-rent apartments, market-rate rental apartments and “for-sale” units, or condominiums. In the third quarter, the MPI component tracking sentiment about market-rate rental production increased from 63 to 69, and has now been over 60 for five consecutive quarters—the longest sustained period of strength since the inception of the index in 2003. The component tracking sentiment on condo production increased from 41 to 44—the highest reading since the fourth quarter of 2005. In contrast, sentiment on low-rent apartment production dropped 15 points to 46. The weakness in the low-rent component of the MPI was likely due to a specific provision of the Low-Income Housing Tax Credit that is set to expire at the end of the year. The prospect of dealing with this has been making lower-rent projects difficult to underwrite. 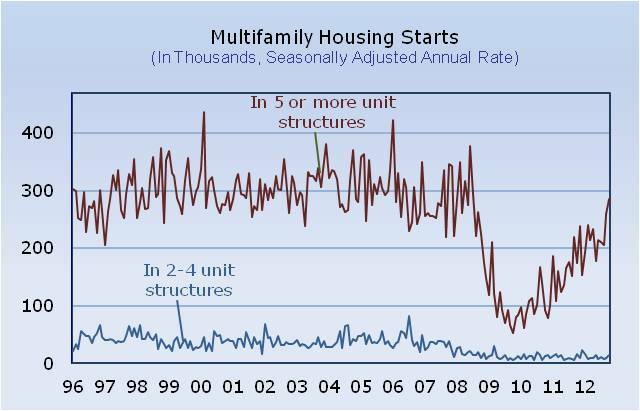 For complete history of the MPI and its components, see the web page for NAHB’s Multifamily Production & Vacancy Indices. In October, the previous month’s upward trend in multifamily production continued, as starts in buildings with five or more apartments came in at a (seasonally adjusted annual) rate of 285,000. Although the line isn’t completely solid, buildings with at least five apartments are generally a reasonable way to draw a distinction between smaller “mom and pop” operations and the province of professional property owners, managers and multifamily developers. At 285,000, the Census Bureau’s preliminary five-plus starts rate for October was up 10 percent from September and up 63 percent year over year—illustrating how far the recovery in multifamily production has come from the historic trough of 2009 and 2010. In fact, 285,000 is high enough to rank among the lower monthly five-plus starts rates recorded during what many consider to be a “golden age” of sustainable multifamily production (roughly 1997 through 2006). Also in September, the rate at which new five-plus permits were issued dropped 10 percent, to 280,000, and the backlog of unused five-plus permits in the pipeline fell by 7 percent, to 42,600. Both these permit numbers were up more than 40 percent year over year, however, so they aren’t a major sign of weakness (although a five-plus starts rate as high as 285,000 may be a little hard to sustain in the short run).